The tunnel is slightly over 5 miles long, so the train travels at just 16¾ mph? About the only good reply I could do would be to check the arithmetic. Sorry, I have no idea what the normal speed is through the Connaught Tunnel. But I do know that it took us approximately 18 minutes, in September. RMR trains are restricted to freight train speeds, and the speed limit for freights in the Connaught Tunnel is 20 MPH. Here's the view of the Kicking Horse River area of the CP Mountain Subdivision, between Golden BC and Field BC. - from an eastbound trip on Rocky Mountaineer, in SilverLeaf service. This is a long video, for those that like the detail. This is an eastbound trip through the tunnels, in Rocky Mountaineer SilverLeaf service, on September 19, 2018. Low Light Mike thank you so much for sharing your incredible journey. I have looked at all your posts, several many times over. Several friends too have been following the trip. I know this is a maritime board, but thankfully we have a rail section. Ships are my primary focus as that is the industry I am in, but rail is awesome too. Again, thanks for taking us along with you! Thanks, good sir. I had lots of fun doing various levels of detail in my video edits. There are some videos that I haven't posted about in this here forum, but they're on my YouTube channel (these are some of the fine detailed items that I've uploaded to YouTube in the past 2 weeks or so). I've got 40 videos on my Rocky Mountaineer playlist. I'm surprised that it's that many. I think I've enhanced the YouTube library of Rocky Mountaineer videos, LOL. ...and here's the final video: The arrival into Banff. I love the evening-light view of Mount Rundle. 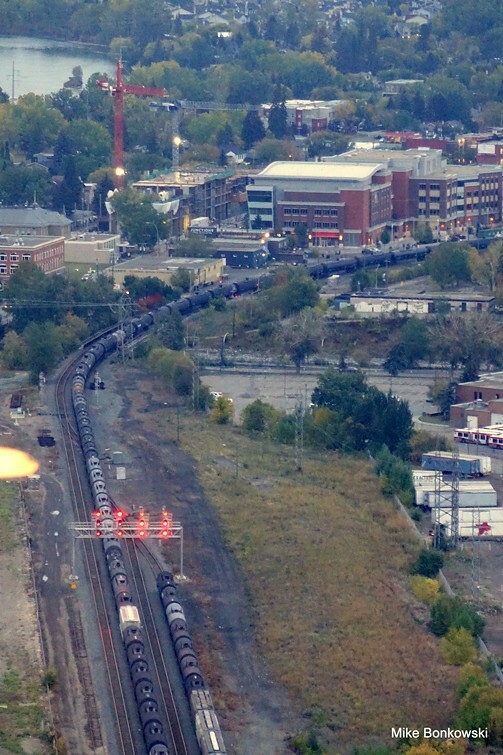 Here's an eastward view of the CPR mainline in Calgary, seen from the Calgary Tower on a September 2018 evening. The train is crossing the Elbow River. Sad news, today 3 Canadian Pacific employees lost their lives in a runaway early this morning. 3 crew members killed in CP train derailment near Field, B.C. Three Canadian Pacific Railway crew members were killed early Monday in a train derailment east of Field, B.C., the company says. The westbound freight train went off the tracks at about 1 a.m. MT, CP said in a release. The fatally injured crew members were on board the train at the time. British Columbia's Environment Ministry confirmed between 30 and 40 grain cars are off the tracks.